Authors are invited to submit contributions for review and possible presentation in the symposium on topics of interest to AP-S and URSI including advancements and innovations in the fields of electromagnetics, antennas, and wave propagation. Suggested topics and general information are listed in this call. In addition to regularly scheduled sessions for oral and poster presentations, there will be a student paper competition as well as several special sessions, workshops, tutorials, and short courses that will address timely topics and state-of-the-art advancements in these fields. All paper submissions are due January 18, 2016 (23h 59m at International Date Line; UTC -12 hours) This is equivalent to 6:59am January 19, Eastern US Time..
All paper and abstract submissions must be received in PDF format via the symposium Web site on or before Monday, January 18, 2016. This is a firm deadline. Papers will not be accepted after this date. Only electronic submissions in PDF format will be accepted. Please consult the symposium Web site for the latest instructions, templates, and format examples. Only the author who submits the paper will receive an acknowledgement of the submission. Please do not include page numbers on submitted documents. All papers must be written in clear, idiomatic English. Please note that a paper may be excluded from distribution after the conference (e.g., removal from the proceedings submitted to IEEE Xplore) if the paper is not presented at the conference. Address all AP-S and URSI correspondence, including inquiries concerning papers, abstracts, the technical program, and copyright forms, to Andrea Alu (papers@2016apsursi.org). The format and length requirements have changed with the 2016 Symposium. All submissions for inclusion in the official Proceedings (both AP-S papers and URSI abstracts) must be submitted in the IEEE standard two-column format. URSI authors who do not wish to be published in the official Proceedings can still submit a single-column, single-page abstract. Templates for Microsoft Word (.doc) and LaTeX2e are available at the symposium Web site. The maximum length of a submission for either AP-S or URSI is two pages. In order for an accepted submission to be included in what is submitted to IEEE Xplore, it must be two pages: this is true for both AP-S and URSI submissions. A signed IEEE copyright form must accompany all submissions. Papers submitted without copyright forms will be rejected. Instructions for electronically signing and submitting copyright forms are available as part of the paper submission process. For an accepted paper to be listed in the technical program, one of the authors of the paper must be registered by May 1, 2016. In the event that this is not possible due to funding or visa issues, another registered attendee must be identified to serve as presenter prior to May 1, 2016. URSI Abstracts may be EITHER one-page or two-page. Accepted URSI abstracts which are two pages will be archive on IEEE Xplore automatically. Accepted URSI abstracts which are one page will NOT be included on IEEE Xplore. Eligible entries in the Student Paper Competition must have only one student author, and that student must be the first author. Each additional co-author must submit a signed letter indicating that his/her contribution is primarily advisory. Letters must be in PDF format and must be uploaded to the symposium’s student paper website in the indicated area at the time the paper is submitted. All Student Paper Competition entries will be evaluated using a double-blind review process in addition to the normal review process used for regular submissions. Detailed instructions will be available on the symposium website. For additional information, contact Zhen Peng (spc@2016apsursi.org). The language of the symposium is English. The text should be formatted single-spaced and sized for 215.9 x 279.4 mm (8.5 x 11 inch) paper. The title should be horizontally centered 19 mm (0.75 inch) from the top of the first page. The author's (or authors') name and complete organizational affiliation should be two lines below the title. If there are multiple authors, the presenter is to be specified with an asterisk superscript at the end of the name. The text should start three lines below the last name. Left and right margins should be 15.7 mm (0.6 inches). A 25.4 mm (1 inch) margin should be present at the top and bottom of all pages. The allowed margins, and associated tolerances, for all pages are: 15.7 +/-2.5 mm (0.6 +/-0.1 in) for the left and right margins; 25.4 +/-2.5 mm (1.0 +/-0.1 in) for the top margin; and 25.4 mm (1.0 in) minimum for the bottom margin. Paragraphs are to be separated with one blank line, and a minimum font size of 11 points is recommended to maintain readability. Submissions must withstand a linear reduction to 70% of original size and maintain readability. Please do not include page numbers on submitted documents. Only designated contact-authors will receive an (automated) acknowledgement of the submission. All AP-S summary papers for the 2016 symposium must be submitted in the IEEE standard two-column conference format. Papers cannot exceed two pages in length, including text, references, and figures. The introduction of the paper should clearly indicate the unique aspects of the submission and how it relates to previous work. A signed (electronically) IEEE copyright form must accompany all AP-S submissions. Papers submitted without copyright forms will be rejected. Instructions for electronically signing and submitting copyright forms can be found under "Steps for Submission" below. URSI submissions must consist of at least 250 words and may be either one page or two pages, including figures. Do not include a list of references. However, a few open-literature references may be included parenthetically, for example: (R. L. Lewis and J. R. Johler, Radio Sci., 2, 75-81, 1976). Acknowledgement of financial support is not deemed appropriate. The Commission and session topic for the abstract must be identified at the time of submission. Templates that can be used for the abstracts are available below. If accepted, submissions that are less than two pages will be included in the proceedings distributed in electronic form at the symposium but will not be submitted for inclusion on IEEE Xplore. Accepted submissions that are two pages in length will also be submitted for inclusion on IEEE Xplore. IMPORTANT: The format in which you prepare your URSI abstract determines whether it will be published in IEEE Xplor or not! 1-page, 1-column abstracts WILL NOT be published in IEEE Xplore. 2 page maximum, 2-column submissions WILL be published in IEEE Xplore. AP-S/URSI will no longer ask you if you wish to publish in IEEE Xplore; the decision is determined by the format of your submission! If accepted, submissions that are less than two pages will be included in the proceedings distributed in electronic form at the symposium but will not be submitted for inclusion on IEEE Xplore. Accepted submissions that are two pages in length will also be submitted for inclusion on IEEE Xplore. To foster active involvement of students and to ensure a future membership of highly qualified researchers in the IEEE Antennas and Propagation Society, the Society sponsors a Student Paper Competition at its annual Symposium. More detailed information should be consulted here. Questions about the competition should be e-mailed to the 2016 AP-S Student Paper Competition Coordinators (spc@2016apsursi.org). For consideration in the Student Paper Competition, the student must be the only student author and must be first author on the paper. 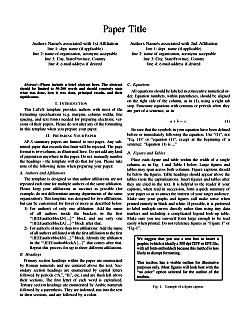 Each other co-author must provide a signed letter indicating that his/her contribution to the paper is primarily advisory. (For example, a paper with a student author and three co-advisors would have three letters from the co-advisors at the time of submission.) Letters must be in PDF format. 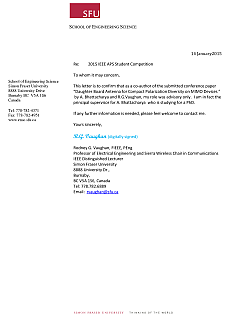 Student authors of student competition papers are REQUIRED to upload these letters IN ADDITION TO THEIR PAPER via this Web site as part of their paper submission. All SPC papers will be judged using a double-blind review process. In double-blind reviews, the identities of the authors are withheld from the reviewers in addition to the usual practice of having the identities of the reviewers withheld from the authors. Therefore, a student must submit two copies of the SPC paper to the Web site — one without any identifying information, including authors' names, affiliations, funding sources, etc., and one intended for publication in the Symposium proceedings that includes authors' names and affiliations, etc. Other than the identifying information, the two versions of the paper should be identical. Additional information and guidelines regarding paper preparation are available here. Papers or abstracts for the special sessions must comply with all submission requirements and instructions for authors, including the submission deadline. A list of the special sessions is available here and in the submission Web site. Please note that there are three types of special sessions, AP-S only, URSI only, and joint AP-S/URSI, and this establishes the submission format to be used. An AP-S only session requires papers in the AP-S format, and an URSI only session requires abstracts in the URSI format. Either the AP-S or URSI format can be used for the joint AP-S/URSI special sessions. Questions on special sessions should be directed to the special session co-chairs at specialsessions@2016apsursi.org. Organizers of the special sessions will be provided additional instructions. PLEASE NOTE: If you encounter an "Unauthorized URL" when attempting to submit the IEEE Electronic Copyright form, please disable any browser plug-ins or extensions, and make sure any firewall software you may use is not blocking the HTTP Referrer header. Is your submission an IEEE AP-S Paper, or an URSI Abstract? Publish-ready 2-column, 2-page URSI Abstract ready. One-page abstracts will NOT be archived on IEEE Xplore under any circumstances.